“By the time we got to Woodstock we were half a million strong …” Joni Mitchell sang. Not quite. But a ton of people were at Yasgur’s farm, 49 years ago this month. There won’t be quite as many at Weston’s Coley Homestead (104 Weston Road) on Saturday, September 15 (2 to 8 p.m.). They won’t get naked, sleep in the mud, and hear Jimi Hendrix, Janis Joplin and Country Joe rock America. Hey, this is 2018, not 1969. But it will still be very, very cool. The festival is the finale of the Weston Historical Society’s summer-long retrospective of ’60s music. Exhibits, concerts and forums have explored the impact of rock, psychedelia, folk, Motown, soul and more on our country — and our little slice of Fairfield County. But music is key. 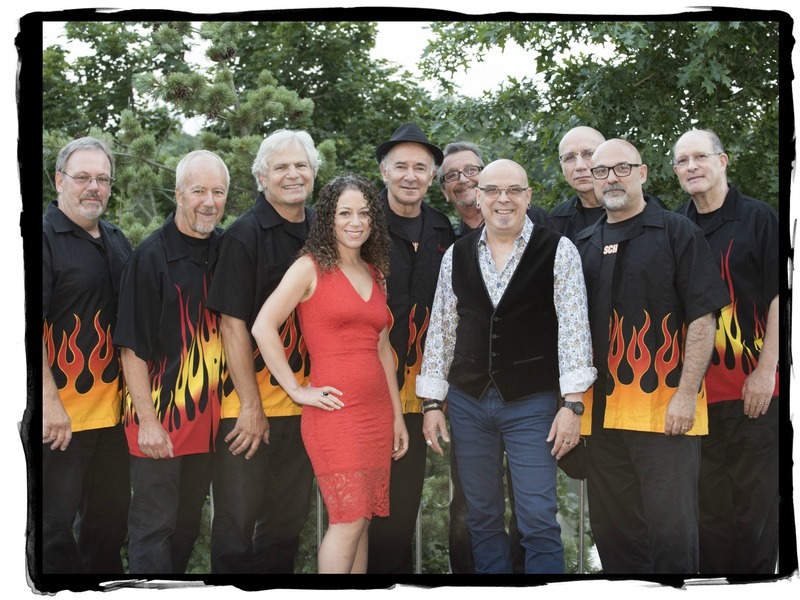 Westonstock features Old School Revue — the popular local band fronted by 1966 Staples High School graduate Roger Kaufman. The Saugatuck Horns — a 6-piece R&B band — will be decked out in vintage ’60s attire. Other performers include local favorites (and talented neighbors) Chance Browne, Rob Carlson, Crispin Cioe, Chris Coogan, Tim DeHuff, Charlie Karp, Jeff Southworth and David Weber. All have long and storied musical pedigrees. They’ve played with the Rolling Stones, Buddy Miles, Jimi Hendrix (though not at Woodstock) and many more. Roger Kaufman (center, with hat) and his Old School Revue. The cars, meanwhile, will take you back to the days of listening to great music while cruising (or “watching the submarine races”). Many are on loan from Dragone Classic Motors. There are also ’60s music trivia contests, and ’60s dance demonstrations. Jr’s Hot Doggin’ Food Truck and Olive & Julep Craft Cocktails head the list of food and beverage suppliers. Whether you recall the ’60s, can’t remember them (“if you do, you weren’t there,” Grace Slick or Timothy Leary or Robin Williams supposedly said), or were not yet born, Westonstock is for you. All you need is a blanket, a lawn chair and some patchouli. This entry was posted in Entertainment, Looking back, Organizations, People and tagged Charlie Karp, Chris Coogan, Crispin Cioe, Old School Revue, Rob Carlson, Roger Kaufman, Weston Historical Society, Westonstock, Woodstock. Bookmark the permalink. Groovy, Far Out, I’m spacing man! Thanks for this info, Dan! I was singing the CSN&Y version of the Woodstock live recording, in my mind, while reading your lyrical post today! The ideals existing within the music of that time became subsequently squashed by the politics and the … well, I don’t want to kill the mood right now.